The “white teeth” phenomenon is common among people but in some cases the traditional teeth whitening may not be convenient for everyone. 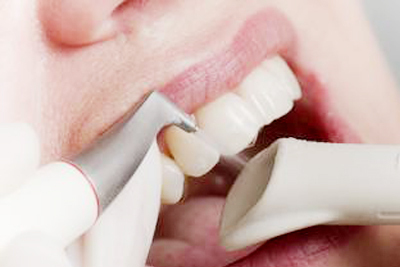 The procedure of stain removal with the usage of air flow is an ideal way to remove teeth discolorations. They can be caused by smoking and drinking coffee, tea, red wine. This procedure also whiteness the teeth by removing the plaque formation found on the teeth surfaces. The air flow intervention can be also used for cleaning the open fissures before the sealing treatment begins and according to many dental professional this is the best method to use before the boning process. All patients should know that this procedure is not teeth bleaching treatment but, the air flow ill definitely enhance the brightness of the patient’s teeth and will definitely provide a sparkling and healthy mouth in only few minutes. The most important thing for all patients is to know that this procedure is painless and it is performed by a water pressure onto the teeth surfaces and also between each tooth. Another thing to consider is that there are no chemicals involved in this dental treatment option. This treatment can be used as a pre-teeth whitening treatment. How often a patient should schedule such a treatment depends on the condition of their teeth. But, however, cleaning and polishing are important procedures and should be part of the overall dental hygiene habits of the patient. It is advisable to visit a dental professional at least twice per year in order to maintain the teeth white and healthy. Depending on each case, the dental worker will give advice about the frequency of the appointments. Another great advice is to brush the teeth after smoking and drinking drinks which can color the teeth. Every patient is his own story and every treatment is performed accordingly.